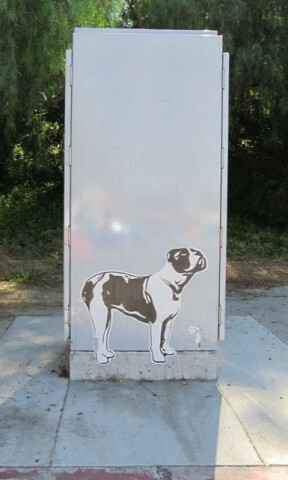 Everyone’s favorite British graffiti artist Banksy has left dreary, merry olde, rain-soaked, proper-opper England and high-tailed it for tony Woodland Hills, the nicer part of the toilet that is the Valley, of the toilet that is Los Angeles. Of the toilet that is Southern California! I looove LA! We love it! Where was I? 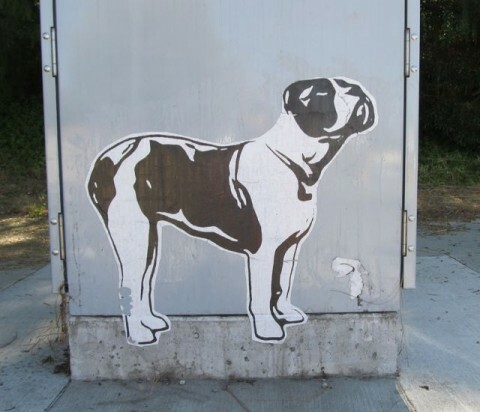 British graffiti guy, Banksy, Woodland Hills – ah yes! Everyone’s favorite British graffiti artist Banksy has left merry olde England and high-tailed it for tony Woodland Hills where he’s left his mark – and, brother, I have proof! Irrequivutable proof! Feast your peepers on this! It’s on this…I don’t know what it is, some sort of electrical box. Or telephone switchbox, like with all the wires in it. I don’t know what they’re called. Anyway, it’s on one of those – and I saw another just like it on the opposite corner! How’s that for proof! It’s on one of the dog’s front legs, sure. You can’t really see it in the other photos, because it’s really small. Anyway, there you go, Banksy fans! As to what he’s trying to say with this piece, I think it’s obvious: Something about crass commercialism, and corporate England, or in this case corporate America, and the government, and probably the military, and maybe the media, too, right? Oh! Oh! And Mickey Mouse! And also to please be considerate and clean up after your dog. No one wants to step in a big pile of dog crap you just left on the sidewalk, am I right? Posted by Ted on August 4, 2011, 9:00 AM.